The AIBA World Boxing Championships for men got off to a an exciting start on Monday with 32 bouts in four sessions. 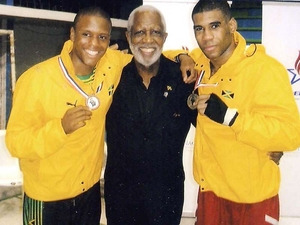 A record 570 boxers from 113 countries are participating, and Jamaica is being represented by two overseas based boxers, middleweight Reece Shagourie and light heavyweight Jovan Young. Before the tournament started, these two boxers were among 60 invited by the International Boxing Association (AIBA) to participate in a two-week training camp dubbed 'The Road to Baku'. Also invited was coach Barringtn Graham who participated in the training sessions. Young, one of 57 entrants in the light heavyweight division (81kg), will bow into action today against a tough opponent. He goes up against Oleksander Gvozdyk from the Ukraine, who is reputed to be a very good fighter and likes to go after his opponents early. Shagourie, one of 67 entrants in the middleweight (75kg) class, will bow into the competition on Saturday against another tough opponent, Mexican Juan Mercado. Both boxers are aware of the quality of the opposition but are determined to give good performances as they seek to make it into the second round of competition. One boxer from the Caribbean, Barbadian Emmanuel Anderson, made a successful debut on Monday when he outclassed Dimitar Tashkov from Macedonia. He boxes next against the No. 3 seeded Teymur Mammadov from Azerbaijan. The world championships, which started in 1974 with - competition in Cuba - as a quadrenennial tournament, is now held every two years and will be the first Olympic-qualifying event in boxing for London 2012.